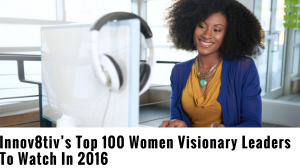 I started 2016 with a recognition by Innov8tiv Magazine: I was voted as one of the Top 100 Women Visionary Leaders to Watch in 2016 (NO PRESSURE LOL). The women selected peeked Innov8tiv’s interest throughout the year 2015, and if precedence is anything to go about, we should expect greater things from them over the next year. They have demonstrated leadership, innovation, ingenuity but most importantly the potential to positively impact the community around them. CONGRATS TO ALL THE LADIES, CHEERS TO A GREAT YEAR!